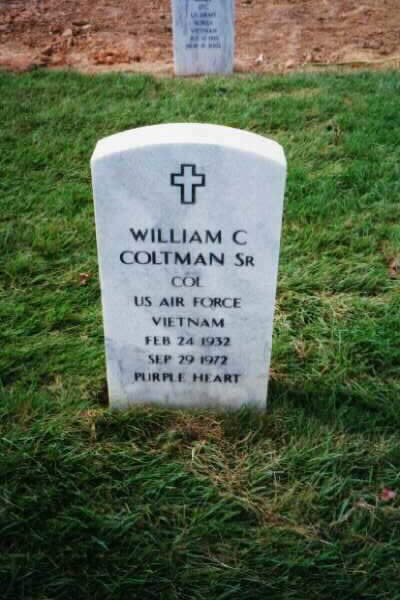 William Clare Coltman was born on February 24, 1932 and joined the Armed Forces while in Pittsburgh, Pennsylvania. He served as a 1115G in the Air force, 430 TFS 474 TFW, and attained the rank of Colonel/O6. He began a tour of duty on September 29, 1972. Colonel Coltman is listed as Missing in Action. A New Braunfels widow found comfort after 30 years, when her husband’s remains were returned to the United States. United States Air Force Col. William Clare Coltman Sr., a fighter jet pilot, was classified Missing In Action Sept. 29, 1972 during the Vietnam War. Six years later he was reclassified as Killed In Action. Gail C. Coltman, her daughter, Kimberly, and son, William Jr., ended a search to find and repatriate his remains with a burial service at the Arlington National Cemetery this past week. Since that life-changing day, Gail said the family pulled together to ensure that the memory of “the best fighter pilot that ever lived,” stayed alive. Coltman was a test pilot and an F-111 aircraft commander for the 474th Tactical Fighter Squadron at Nellis AFB in Nevada. It was during this time that he was called to a second tour of duty in Vietnam. “When I opened the door that day and saw the men and how they were dressed, I knew right away,” Gail said. She and her children had hoped for the best, giving no thought to the worst. Gail said that after they got the news that he was MIA, they remained hopeful that Coltman was a prisoner of war, but later accepted the reality when all POWs were returned to the United States. Gail said she was not the type of wife to worry and never discouraged her courageous husband. “In fact, this was his second combat mission,” she said. Gail said her daughter Kimberly, a major in the U.S. Air Force, was the most instrumental in getting her father’s remains returned from Southeast Asia to the United States. Kimberly, who was 12-years-old when her father was reported missing, lobbied for a faster timetable. The U.S. Army Central Identification Laboratory in Hawaii provided the family with information in February of 2001. The results showed that Coltman’s dental remains had been positively identified. 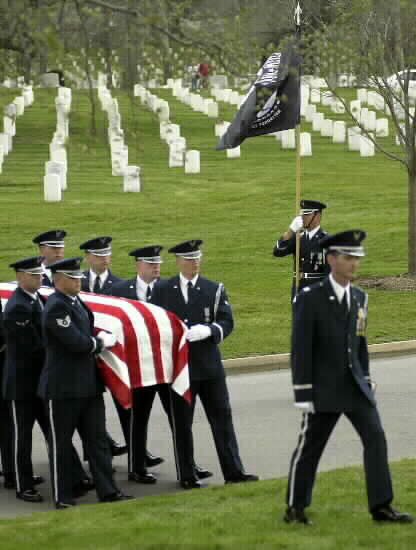 Coltman’s remains were brought to U.S. soil along with 21 other American servicemen. Gail said the April 3 memorial service was everything her husband deserved. The service included prayer, singing, a 21-gun salute and the presentation of the flag that draped the Coltman casket. “It is a bittersweet feeling — more than ever was expected, and the closure we have always wanted. 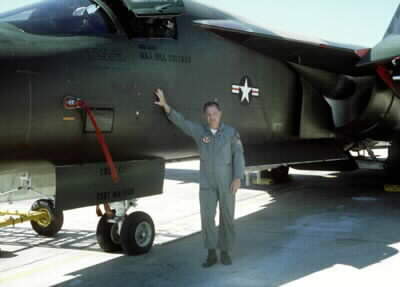 In an undated photograph, Air Force Col. Bill Coltman stands by his aircraft. WASHINGTON -- Colonel William C. Coltman Sr. was laid to rest with full military honors at Arlington National Cemetery on April 3, nearly 30 years after he was declared missing in action during his second combat tour in Vietnam. Family and friends gathered for a memorial service in the Fort Myer Memorial Chapel, Fort Myer, Virginia, to celebrate the life of Coltman, who was reported missing in action September 29, 1972. They remarked about his impish nature, and Crow remembered the times he would ask, “Who’s the greatest brother in the world,” she asked. On September 25, 1972, Coltman deployed for his second combat tour in Vietnam in support of Linebacker II. According to historical records, 48 F-111As with the 474th Tactical Fighter Wing at Nellis Air Force Base, Nevada, arrived in Southeast Asia on Sept. 27, to help check the accelerating advance of the North Vietnamese. 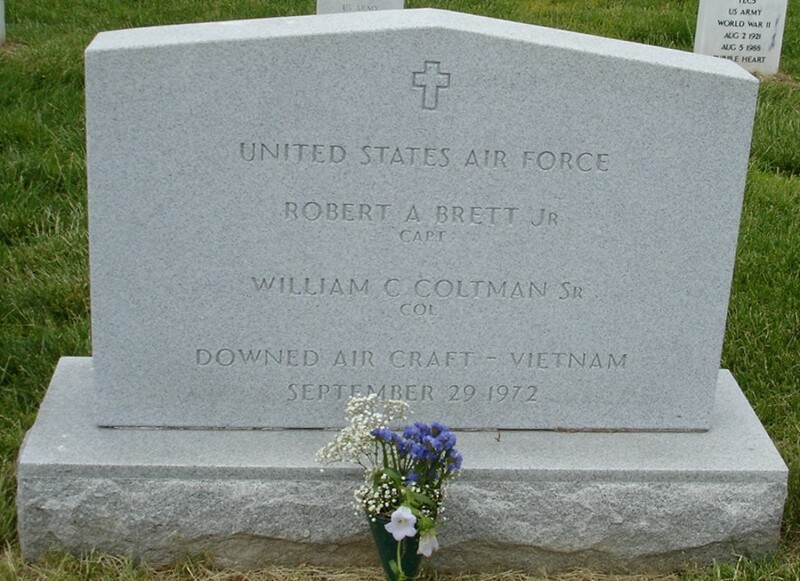 On September 28 of that same year, the first night of F-111 operations, Coltman and First Lieutenant Robert A. Brett Jr. disappeared while on a strike mission in North Vietnam. The last radio and radar contact occurred as the aircraft approached the Loatian border. At that time, Coltman was said to have deviated from his programmed track to avoid thunderstorms. Radio contact was never reestablished and on September 29, 1972, both men were declared missing in action at the time of estimated fuel exhaustion and after a search and rescue operation produced no clues. An investigative team with Joint Task Force–Full Accounting discovered wreckage in Houaphan Province, Northern Laos, on August 1, 1998. The site was initially excavated in March 2000, and three more digs followed. The final excavation occurred in September and November 2000. On November 20 of that year the remains from the site were returned to U.S. soil, and in the months that followed, the U.S. Army Central Identification Laboratory at Hickam Air Force Base, Hawaii, began the identification process using the techniques of forensic anthropology and dentistry. The laboratory positively identified Coltman’s remains in December 2001 and was able to distinguish that another crew member was with him, said Ginger Couden, laboratory spokesperson. Coltman’s relatives traveled to Hawaii on March 29 to bring his remains to Arlington for burial. Coltman’s widow, Gail Coltman, was presented with the flag that had draped her husband’s casket. Coltman’s brother, retired Colonel (Dr.) Charles A. Coltman Jr., removed the MIA bracelet he had been wearing all these years and wrapped it around a rose before placing it on the casket. Major Kimberly G. Coltman, who was only 12 when she last saw her father, rendered a salute after placing a rose on the casket, in loving memory of “the best fighter pilot in the world,” as she called him. What is important to the family, she said, is that her father is now at peace. “The ceremony at Arlington helps to bring closure to something that’s been looming in our lives for so long,” she said. In this celebration of his life, she said, family and friends are happily reuniting after not having seen one another for years. The current number of Americans who have been recovered and positively identified since 1973 from the war in Southeast Asia is 653, according to figures compiled by Joint Task Force-Full Accounting officials. Still unaccounted for are 1,932 Americans -- 1,457 in Vietnam, 409 in Laos, 58 in Cambodia and eight in China. 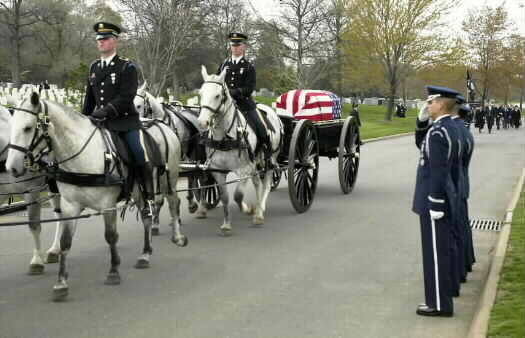 Old Guard's Caisson Platoon during a burial service at Arlington National Cemetery on April 3, 2002. 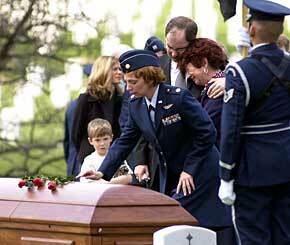 Air Force Base, Idaho, places a flower on the casket of her father, Air Force Col. William C.
Coltman, during a burial service at Arlington National Cemetery on April 3, 2002. THE REMAINS OF three soldiers were turned over by Vietnamese officials on Saturday at a ceremony attended by President Clinton in the Vietnamese capital of Hanoi. The remains arrived at Hickam Air Force Base on Oahu in 21 silver caskets, each draped with an American flag. Officials believe one set of remains may be those of Air Force Colonel William Coltman, whose jet was shot down in North Vietnam in 1972. Coltman's daughter, Major Kim Coltman, and his widow, Gail, attended a 45-minute repatriation ceremony to honor the unidentified men, whose remains will undergo DNA tests. “I hope they are my father's remains,” said Kim Coltman, who was 12 when her father disappeared. 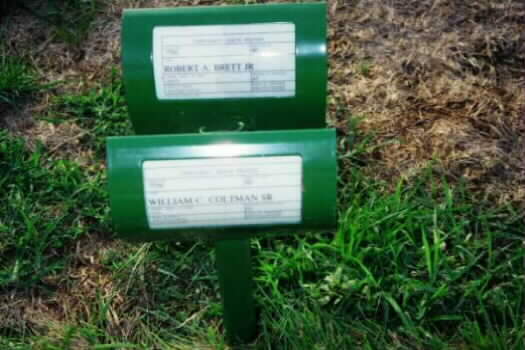 The Coltmans said they were hoping to bury their relative at Arlington National Cemetery, where a marker in his name already sits above an empty gravesite. There are 1,992 American servicemen unaccounted for from the Vietnam conflict, including 1,498 believed to have died in Vietnam, 421 in Laos, 65 in Cambodia and eight in China. Approximately 8,100 servicemen remain missing from the Korean War.